The Translational Research Unit (TRU) is a core facility of the Institute of Pathology. 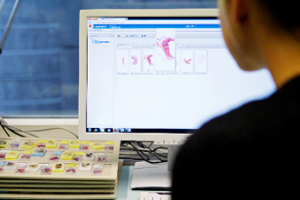 We provide expertise in histopathology techniques, tissue visualisation, digital pathology, digital image analysis, next-generation Tissue Microarrays (ngTMAs) and biobanking. Human Research Act compliant workflows for prognostic biomarker studies and questions of consent and ethics are important aspects of the services provided. Please contact us at tru@pathology.unibe.ch. 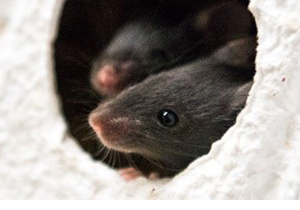 The TRU supports research projects using patient-derived rest material and animal tissues from investigators on and off campus. We are involved in national (e.g. SAKK) and international collaboratives, where expertise in tissue handling and biomarkers is needed. More than 600 requests are processed per year. Services and associated pricing can be found here. 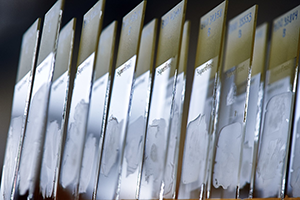 Our biobank handles more than 5’000 tissue samples per year and stores more than 37’000 aliquots of tissue. We work with Human Research Act compliant workflows, following SOPs documented in a Quality Management System and received the ISO accreditation for the interfaces with the clinical pathology lab (ISO 17025/15189). 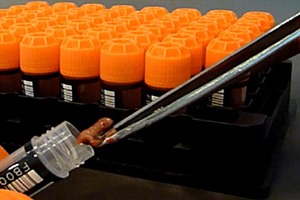 Expertise in histology techniques is the foundation of our lab. We process tissues and make sections for many downstream applications such as conventional staining, immunohistochemistry and in situ hybridisation, RNA and DNA extraction, laser capture microdissection and MALDI. Our lab establishes a large number of antibodies per year in human and animal tissue. We validate all new antibodies (commercial and homemade) in positive and negative cell lines. Our catalog now exceeds 450 antibodies. 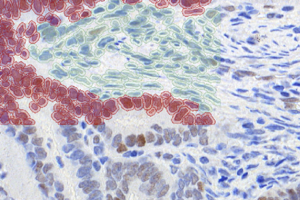 We perform immunohistochemistry, double-staining, mRNA in situ hybridisation (RNAScope®), TUNEL, immunofluorescence and set up stainings on chamber slides for cell cultures. We set up protocols for researchers and are always ready to experiment with new methods. Scans are accessible and can be viewed and annotated by external collaborators via our Image Management Software, by login. TRU digitizes hundreds of whole tissue slides and tissue microarrays weekly using one of three slide scanners dedicated to research. We can offer digital image analysis as a service or as training to students and researchers interested in using the open-source software QuPath and have experience with numerous commercially available image analysis programs. Accurate biomarker research starts with high quality annotated samples. ngTMA is the creation of tissue microarrays using digital slides, which allows researchers to study specific histological interfaces. 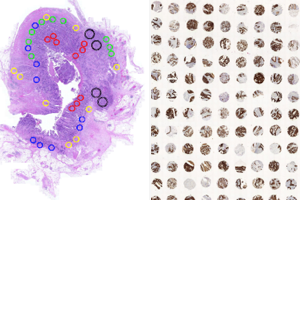 Heterogeneity can be accounted for by multiple tissue areas, that are marked using different colors on digital scans. Since 2012, TRU has generated more than 600 ngTMA blocks from >12’000 patients and hundreds of thousands of tissue spots using the ngTMA approach. Our digital archive of slides contains massive amounts of image data together with clinical and histopthological information of patients. We provide consulting and study design to answer very targeted research questions and love to speak about what we do and how we can help. Whatever we do can apply to animal tissues, from histology to visualisation, digital pathology, image analysis and ngTMA construction. Together with the Institute of Animal Pathology, we are delighted to collaborate where morphology and histopathology evaluation as well as technology is concerned.